The crisis unfolding in Turkey provides an excellent case study for gold. As news from Turkey has gone from bad to worse the Turkish Lira has plunged by an eye-dropping 30% over the last month alone at the time of this report. Year to date, the Lira has lost around 45% of its value versus the dollar. As observers ponder the possibility of a bailout by the International Monetary Fund (IMF) or even some form of capital controls, Turks are left scrambling to find alternatives to preserve their wealth, and purchasing power and gold is certainly an attractive one. 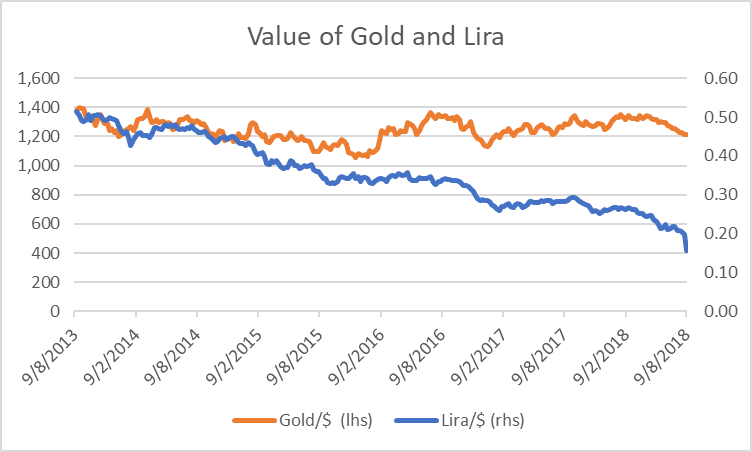 The five-year chart below shows the weekly closing value of gold in dollars as compared to Turkish Lira priced in dollars, with the latest close on August 10th when the $/Lira rate closed at 6.43. Over the past five years the price of gold has fallen by 30% versus the dollar while the Lira has declined 70%. While there is a multitude of reasons for Turkey’s current demise, economic policy lies at the heart of the matter. Put simply, Turkey has pursued an unsustainable, debt driven growth model without significant external control from the Central Bank or the Finance Ministry. In case there was any doubt about this, President Recep Tayyip Erdogan recently installed his son-in-law as finance minister and a relatively unknown 42 year old as the Central Bank governor. Turkey’s perennially high fiscal deficits have been financed with credit and loose money supply, which has led to elevated inflation rate, currently around 16% based on official estimates. The other key factors behind the Lira’s weakness relate to geopolitics. For years President Erdogan has displayed somewhat aggressive behaviour towards the West. His posture began to intensify in the aftermath of the failed coup of 2016 when a deficit of support for him from NATO allies fuelled suspicion and resentment. A widening rift, including his signing a deal with Russia to purchase a new missile system, has burst into a full rupture with the United States. Turkey’s recent decision to detain and charge an American Pastor with espionage elicited a sharp response from the Trump administration in the form of a doubling of tariffs on Turkish steel and aluminium imports and the sanctioning of certain Turkish officials. Erdogan has responded in-kind and offered veiled threats of an end to Turkey’s alliance with the US. This political stand-off has evaporated much of the confidence international investors and major institutions had in Turkey. Turks have long memories, and economic instability is not a new phenomenon to them. A very thorough study (Examining the Value of Money in Turkey over the Long Term (1469-2009), by Adam Abdullah) reviewed Turkish money over 540 years and found that the country’s currency failed the most basic function of money: serving as a store of value. Foreign investors also remember Turkey’s economic tribulations. According to research by MIT, Turkey has defaulted or restructured foreign obligations four times (1876, 1915, 1940, 1978). Underscoring the notion that history repeats itself, the “new Turkish Lira”, which traded at 1.3 versus the dollar in 2007 breached the 7 mark on August 13th. As recently as 2005 the government issued the new generation of Turkish Lira by removing six zeros and converting them at 1 million to 1. On May 22, the Turkish Republic of Northern Cyprus (TRNC) government began discussing abandoning the Turkish Lira. The government of Turkey itself has viewed gold as an important asset for the nation. According to the World Gold Council, Turkey had 232 tons of reserves as of Q2 2018, accounting for 10.4% of its total reserves. Turkey joins countries such as Russia and Belarus have been shifting reserves away from the US dollar and into gold. It also is among a group including Germany, Hungary and the Netherlands which have repatriated their official gold holdings from the U.S. Given the historic volatility in Turkey’s economic situation and her political isolation, it is not surprising that Turks have embraced gold at both the personal and national level. President Erdogan has also made his personal views on this issue very clear. In April he publicly floated the idea of having banks make international loans based on gold rather than dollars as a means of protecting the country from exchange rate pressure, a suggestion he also made to the IMF at a meeting of the G-20. Turkey’s embrace of gold has the additional benefit of enabling transactions to be made outside of the US dollar clearing system with sanctioned trading partners such as Iran. An earlier version of this chart was sent via email. The dates have been updated here for greater accuracy.